Contains natural mucilage compounds to help the action of chewing and salivation to maintain normal gastric and upper intestinal function. 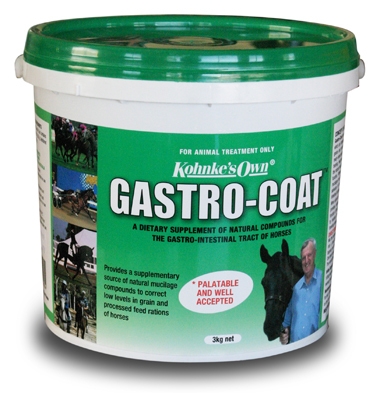 Helps maintain the appetite in hard working and traveling horses. Palatable and well accepted by horses. Drug free – natural mucilage compounds – does not contravene rules of racing/competition – it is a feed supplement – not a drug based medication! Handy Hint: Many horses lose their appetite when worked on an empty stomach or when competed 3-4 hours after a pre-race/competition meal. Mixing Gastro-Coat into 5 litres of dry lucerne chaff, dampened with 50mL Energy-Gold oil to tempt a ‘fussy eater’ and feeding about 30 minutes prior to exercise or competition, prior to traveling or the return trip after racing or competition, will help to stimulate chewing and salivation to assist the normal function of the digestive system and help the appetite and general well-being.